Being invited to a holiday party isn’t bad, of course, especially when I know that the hostess, Mona, is once again on the lookout for a husband. She’ll invite every eligible man she can scrape up, and when it comes to eligible men, that woman can really scrape. And the type of party could be great, too, if Mona hadn’t written on the bottom of my invitation, “Opal, you should be great at making your sweater—you won’t have to haunt used clothing shops!” I’m too lazy to copy all the exclamation points she added. You get the drift. You probably also got the drift of the party’s theme. If you didn’t, here’s a hint: I own the Tell a Yarn shop and I knit or crochet most of my own clothing. You guessed right. Mona’s throwing an Ugly Christmas Sweater Party. I will not be insulted. I will look on the bright side. Crafting something hideous for Mona’s Ugly Sweater Christmas Party should be fun. I’ve got this shaggy craft yarn in both vivid red and blinding white. How about candy cane stripes, to start? And then a green Christmas tree on the front, and I’ll add sequins, spangles,and beads as ornaments. Edna carries quite a selection in Buttons and Bows. Oversized metallic fuchsia and royal blue spangles, perhaps, with some opalescent white ones also. Garlands. A tinsel star as a tree topper. Tiny Christmas lights and a battery pack tucked into a pocket I’ll add to the back of the sweater . . . If there’s a prize for ugly, I expect to win it. However, I will have plenty of competition. My best friends, Edna and Naomi, will want to play along and reach new heights in tackiness, and so will our daughter Haylee and her friend Willow, who is now like a daughter to the other three of us. In Threadville, we can’t help enjoying the challenge of designing and creating. What will Mona wear, I wonder? It won’t be ugly. It will be skin tight and low-necked. And there the rest of us will be, among all those eligible men, in grotesque sweaters we obediently created for ourselves. Hmmm. Candy cane stripes, a decorated and lit-up Christmas tree, and revealing? Now there’s a challenge . . .
What would you do? Have you ever attended an Ugly Christmas Sweater Party? What did you wear, and what were the ugliest sweaters like? 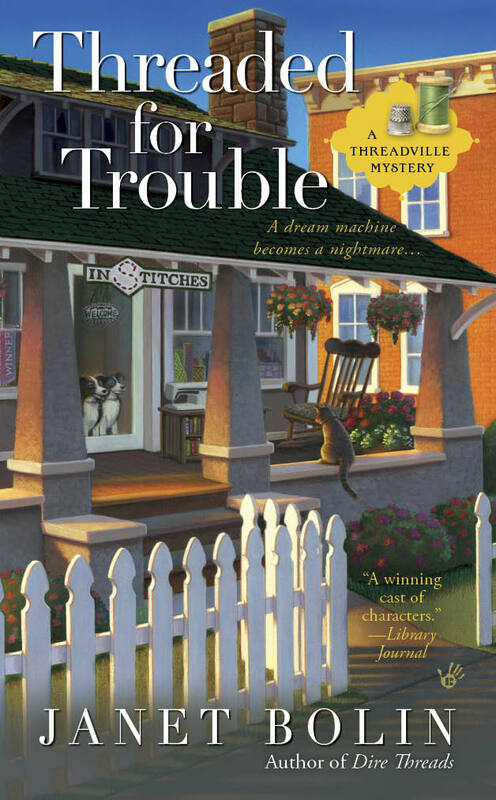 You can learn more about Opal and how she and her friends helped Willow catch a murderer in DIRE THREADS, available in stores everywhere. Talk to Janet Bolin on facebook and twitter. 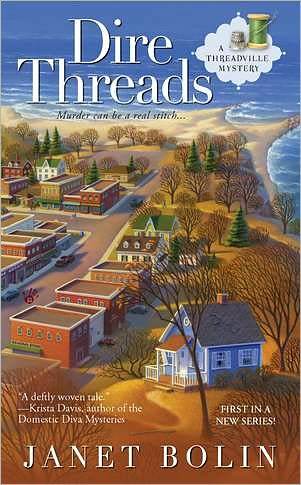 And watch for THREADED FOR TROUBLE, arriving in stores June 5, 2012, and available for pre-order now! LOL! An ugly Christmas sweater party! What fun! Of course, it's mean of Mona to be gorgeous when she's setting up everyone else to wear something ugly. Nevertheless, I love Christmas sweaters, both ugly and beautiful. The battery pack is classic. I hope you include one in your sweater, Willow. ROFL! Must go find a Christmas sweater to wear today! Love the party theme! You show them, Opal. I can picture it now...oops, it's really hard on the eyes. Have fun anyway! I love all sweaters, Krista! Some more than others . . . I hope you find a gorgeous one to wear today. Erika, that sweater in the picture? I turned around, saw it on the table, an thought for a second it was a pizza. Which gives me an idea! Oh, this sounds like FUN!! I love vintage and thrift stores, so you know where I'll get mine!! Ha, Victoria! I know what you mean. I hear they're selling quickly in those shops. And if you Google Ugly Christmas Sweaters, you'll find websites devoted to them! Opal, this reminds me of a scene from Bridget Jones Diary, where she meets Mr. Darcy and he's wearing a horrible jumper sweater and she is in the same, both given my their "mums," and both required for the holiday party. And yet...it's a heartwarming memory for them forever. Love at first sight...almost. So be hopeful. Maybe the man of your dreams, scraped or unscraped, will be there. I think that movie sparked these parties. I hope the man of my dreams will be there, too! And that he's not put off by tinsel . . . The nicest thing about sweaters is you can take them off, and underneath have on an outfit to die for--although that is, perhaps, an ill chosen phrase in your presence. Liz, you're sooooo right! Thanks! Maybe you should have spelled that an outfit to dye for. Lucy, you could knit or crochet a filmy little sleeveless top out of cotton, and decorate it with every tasteless bauble you can find. That's sort of what I did, except I used shaggy yarn. And a BIG crochet hook. That sweater's going to breathe!